Last week I wrote about a Triumph 2000. In the UK the Rover P6 was its main competition. The P6 was introduced in 1963. It was advanced for its time. In the rear was a de Dion tube suspension, it had 4 wheel disc brakes and, in 4 cylinder form, an OHC engine. These things were not usually seen in 1963. 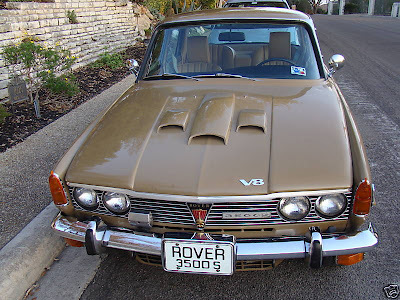 In 1968 Rover made the P6 really interesting by dropping the 3500cc V8 into it. The all aluminum V8, one of the great engines of all time, gave the car some real power without adding much extra weight (The V8 3500 P6, which had more "features" than the 6 cylinder version, weighed only 52 lbs more.) The car was able to hit 60 MPH in around 9 seconds and had a top speed of over 120 MPH. There are some pretty interesting features on the P6s that came to the US, notably a thing called "Icelert" which told the driver when the temperature dropped to a point where ice may form on the road. You can see the sensor in the picture above, it's the silver box next to the right side headlights. The 3500 P6 should have been a huge success in the US. It featured everything the US buyer looked for in a car; power, ride, handling, luxury and style. Initial reviews of the car were glowing. Unfortunately, the 3500 P6 may have been one of the most trouble prone new cars ever sold in the US. The Lucas electrics, of course, were a problem, but build quality, due to BL's poor quality control and a disgruntled workforce, was also extremely poor. The 3500 P6, like so many older cars, is a better used car than it was a new one. Many of the initial problems have been fixed / cured by their previous owners. The 3500 P6 being offered on eBay is in remarkable condition. A California / Texas car, the body (which is rust prone) is straight and rust free. It still wears its original paint. The seller states that"the car runs, drives, steers, brakes exactly as it should". The car has a few very minor, easily cured problems (the clock doesn't work, a small tear in one seat, a brake warning light), but nothing that wouldn't prevent you from driving the car the day you buy it. Interestingly, as this was a CA car, it does not have air conditioning. The seller says he "specifically purchased this Rover for nice weather daily commuting and to participate in vintage car tours and rallies in the hill country adjacent to where I live". That's exactly what this car is perfect for. Find the (also UK) P6 Rover Owners Club site here. Hey, If anyone can help I am looking to purchase these rover 3500S's from the states.UK private collector of Rover P6B's.